The GenXPro small RNA sequencing kit (v1.0) can be used to prepare small RNA libraries to be sequenced on Illumina® NGS instruments starting with 0.01 to 500 ng of total RNA. The library preparation methodology used in this kit allows an accurate identification and quantification of microRNAs, piRNAs and other small RNAs. Fast & simple single Tube Protocol, Gel free! The entire workflow takes place in a single tube. This minimizes losses and increases the efficiency tremendously. Even 0.01 ng of total RNA can be sufficient input material for library preparation. Less PCR cylcles, less duplicates: more output = much lower costs! Thanks to the highly efficient method to generate a sequencable library from small RNA, usually between 5 and 14 PCR cycles less are needed to obtain the minimum amount needed to load a sequencing lane compared to other standard methods. Our kit therefore often allows to drastically reduce the sequencing costs of smallRNA between 50% and 80% compared to most other methods. The single tube protocol strongly facilitates highly paralleled analyses of many sampels on liquid handling systems. GenXPro small RNA sequencing kit applies the proprietary TrueQuant Technology that eliminates PCR-derived copies from the generated gene expression data. Following sequencing of the adaptor-ligated and PCR-amplified libraries, only the sequence with highest quality of each TrueQuant adapter plus template-sequence combination are maintained. 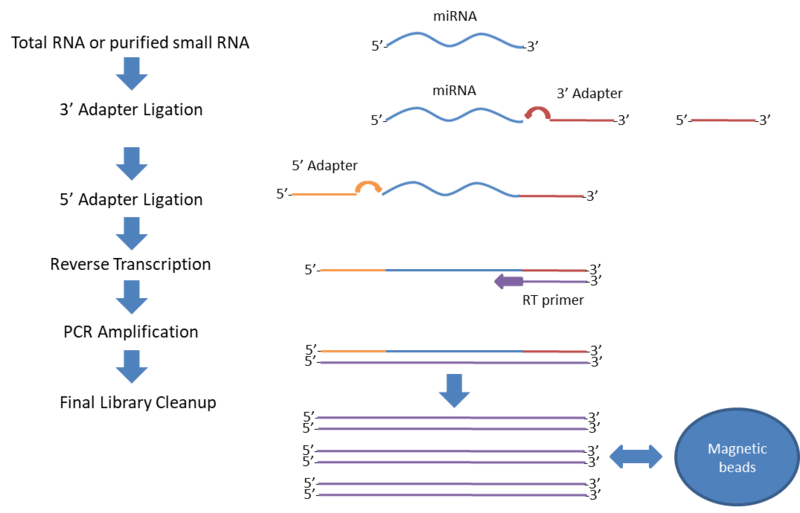 Our protocol allows to generate smallRNA-Seq profiles from down to 200 µl of plasma. Because of the single tube protocol that avoids gel purification steps, combined with the TrueQuant method, very low amounts of input material (0.01 ng) even from strongly degraded total RNA is suitable for processing. Starting with DNase-treated and quality-controlled total RNA, adapters containint ght TrueQuant barcodes are ligated to both ends of the smallRNA, reverse transcribed and the final libraries are ready for sequencing on any of the Illumina MiniSeq, MiSeq, HiSeq, and NextSeq platforms. The present kit allows for multiplexing of up to 8 samples. Please send us an e-mail (info@genxpro.de) if you are interested in a free trial of our smallRNA-kit. We also offer regular and ultra-low input smallRNA seq service. Please inquire, we offer up to 50% discount for PhD students!